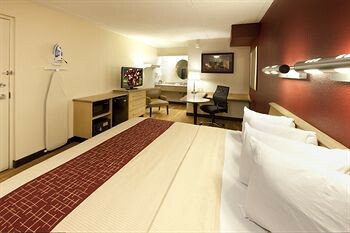 Property Location Located in Oxon Hill, Red Roof Inn Washington, DC - Oxon Hill is convenient to Tanger Outlets and Oxon Cove and Oxon Hill Farm National Park. This hotel is within close proximity of National Children&apos;s Museum and Capital Children&apos;s Museum.Rooms Make yourself at home in one of the 120 guestrooms. Complimentary wireless Internet access is available to keep you connected. Bathrooms with shower/tub combinations are provided. Conveniences include blackout drapes/curtains, and housekeeping is provided daily.Business, Other Amenities Featured amenities include a 24-hour front desk and coffee/tea in the lobby.